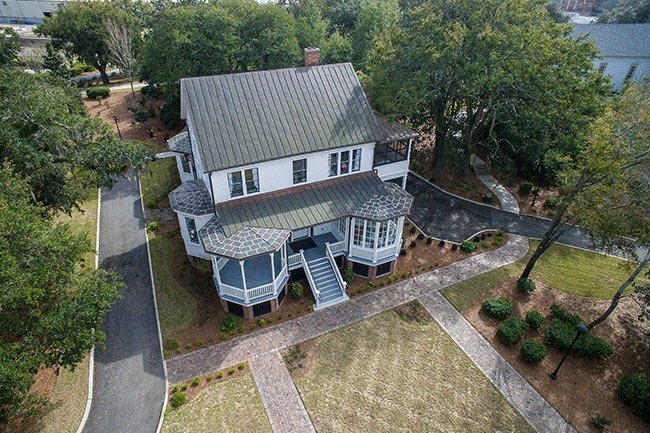 This Victorian-era home on the former Charleston Navy Base was built as a cottage for the keeper of Chicora Park, a public park commissioned by the City of Charleston in 1895 and designed by the Olmsted brothers, sons of landscape architect Frederick Olmsted, in 1896. Five years later, in 1901, when the federal government established the Charleston Navy Yard, as it was then known, along the Cooper River, Chicora Park was converted into an officers’ housing district. This 1898 residence was purchased by the United States for the Admiral until a larger home could be completed. Quarters F, as the keeper’s cottage is now known, is the oldest quarters in the district. As senior officers’ quarters were built in the district in the early twentieth century such as Quarters A – built for the Commandant in 1905 – this home was remodeled to complement the added structures. In 1908 the home was redesigned in a “T-plan,” called such for its T-shape, with the addition of a one-and-a-half story kitchen and dining room. Queen Anne features of the home such as turrets and a tower were removed in the remodeling process, and Quarters F now appears to be more Colonial Revival in appearance, though no architectural style can be applied to the altered building. 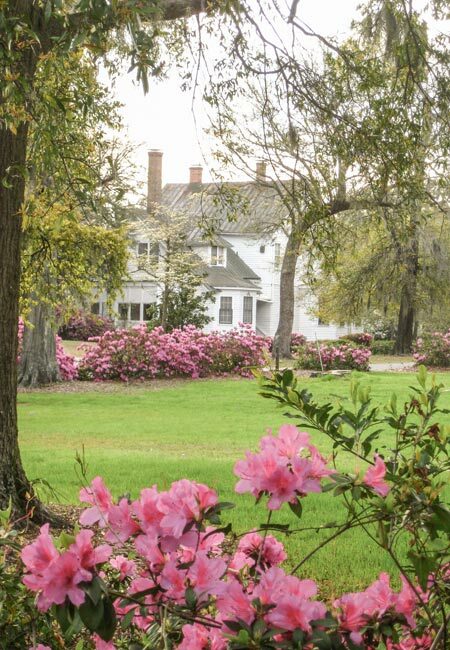 After the Charleston Navy Base closed in 1996, Quarters F was leased as a rental house. The home is presently owned by the City of North Charleston as part of the Charleston Naval Complex Redevelopment Authority. The city has almost completed restoration of Quarters F for an event venue to be used in conjunction with the Eternal Father of the Sea Chapel, which recently was renovated and relocated to the Officer’s Quarters District to make way for the South Carolina Department of Commerce’s plans for an intermodal terminal. Two–story late Victorian-era, irregular T-shaped plan building, with a standing seam metal roof penetrated by three interior brick chimneys. Construction is wood frame with narrow weatherboard over a brick pier foundation. Exterior piers have been infilled with brick underpinning. The main roof is side-gabled with open ends. Original one-story Italianate bays are at either end of the four-room center hall main house plan, with octagonal porch bays at either end of the one-story metal shed roof front porch. The front porch has a central main entry into the house of two-panel double-leaf doors with three-light transom flanked by four-light sidelights. The western octagonal porch bay was enclosed in 1935 with ten-light wood sash and a pair of three-light out-swing double doors with a twenty seven-light transom. The main exterior wooden stair descends from the porch and is centered on the front porch. The porch has turned wood balusters and posts with Folk Victorian or Italianate detail at the post capitals. The main two-story west end has a 1924 second floor shed roof sleeping porch supported by square wood posts and brick piers. The leg of the “T” plan, built in 1908, is a one-and–one half-story kitchen and dining room addition and has a gabled metal roof with hipped dormers. A secondary recessed side entry and wooden stair rises from the east elevation and has a screened vestibule with one-light door, three-light sidelights, and multi-light transom. A rear one-story shed roofed side porch, enclosed in 1934, provides rear access to the kitchen and to a servants’ stair entry to the second floor. Across the south or rear elevation of the kitchen/dining wing is a 1932 one-story enclosed porch with a flat roof and one-light sash. The east elevation of the rear wing has a 1935 one-story angled bay addition to the dining room. Fenestration is irregular with the main two-story portion having mostly single, double and triple grouped four-over-four-light double hung wood sash. Under the open eastern octagonal porch bay is a triple grouping of double hung windows with nine-over-nine light sash. 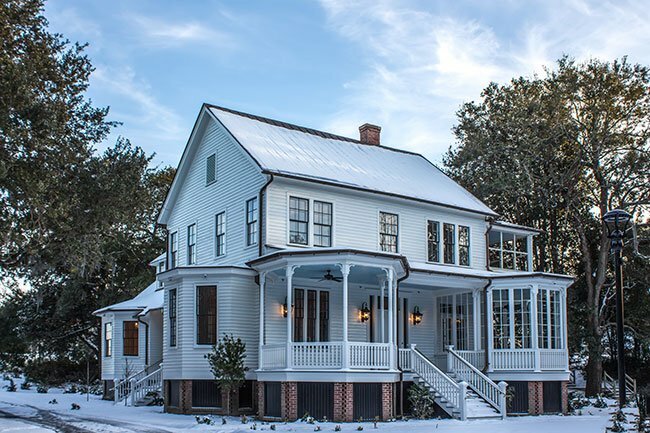 The two one-story original end bays have nine-over-nine-light double hung wood sash. The 1908 rear wing has mostly single and paired groupings of six-over-six double hung wood sash. Quarters F is located just off Turnbull Avenue to the west of Quarters H-I and is near the entry to the Officers’ Quarters Historic District. It is the oldest of the quarters in the district, built in 1898 prior to the establishment of the Charleston Navy Yard and enlarged and remodeled with a “T” plan in 1908. 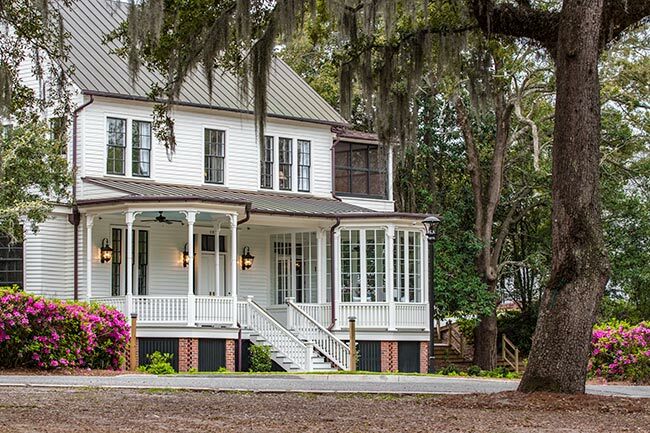 It was built as the home for the resident manager as “the pretty little cottage of the keeper of the Park at Chicora” by the City of Charleston. Purchased by the Navy in 1901 with the surrounding acreage, it became the first building to house officers stationed at the Charleston Navy Yard. The house now has 6,402 square feet on two levels. The front elevation faces northeast but for descriptive purposes the front will be said to face north. The house is in the popular nineteenth century late Victorian cottage style with strong influences of nineteenth century romantic Italianate vocabulary imposed over a traditional nineteenth century classical vernacular rural house form. It is difficult to discern whether thedesigner—or, more likely, the builder—was looking forward or backwards into local vernacular design solutions. When constructed in 1898, the main house had a regular two-story rectangular four-room with center hall plan and a simple side-gable roof. Two central brick chimneys were offset to the south of the ridge. The two front rooms had a large one-story five-sidedItalianate bay at each end. The exterior walls of Quarters F are narrow clapboard over frame construction. While the one-story front porch originally had symmetrical open octagonal porch bays the roofline of the front elevation’s east end had an asymmetrical tower projection with a conical roof. The two Italianate end bays had decorative castellated parapets. In 1908, when the Navy changed the plan to a ”T” shape with the addition of the one-and-one half-story rear kitchen and dining room wing, the modern twentieth century Colonial Revival style and classical revival detail of the other officer housing influenced the major design changes. The tower and parapets were removed and the simple side-gabled roof design was duplicated over the rear wing with hipped dormers being added to the roof’s east and west elevations. 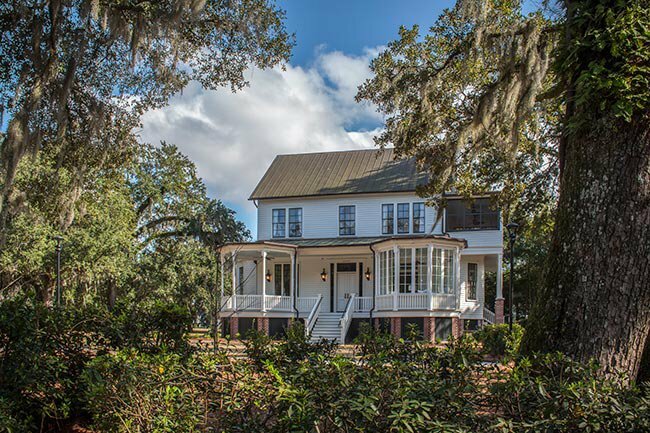 Its form is as a typical lowcountry vernacular Colonial Revival cottage design. While the main north elevation retains some late Victorian detail with the open turned pickets, porch posts and the asymmetrically placed fenestration there is also an earlier nineteenth century Italianate character of the posts in their turned and sawn detail and capitals with small jigsaw “C” scroll brackets. It is difficult to identify any one major style that has shaped the design of the house’s exterior. It definitely is not presently representative of the asymmetrical high-style late Victorian Queen Anne, Stick, or Eastlake designs. The fenestration of the main façade is asymmetrical. To the left of the entry is a triple grouping of narrow nine-over-nine-light double hung wood sash. Flanking the second floor center six-over-six-light sash is a pair of four-over-four-light sash and to the east and a narrow triple grouping of four-over-four-light sash to the west. The remainder of the windows in the two-story portion are symmetrically placed four-over-four-light double hung sash. The eastern elevation’s first level sash next to the bay is nine-over-nine lights. The gable ends have simple rectangular louvered vents. In 1924 the western octagonal open porch bay was enclosed with glazing. Double ten-light wooden windows were installed with a pair of three-light double doors exiting onto the front porch. The doors have a fixed twenty-one–light transom. Windows in the rear 1908 addition are a combination of symmetrically placed single and paired six-over-six-light sash. Quarters F today reveals various additions and changes to its original 1898 and 1908 “T” shaped plan. In 1908 when the rear wing was constructed wood framing, narrow weatherboard siding, and trim matched the detail of the earlier house. A concrete and brick foundation was added to the rear that included a basement with a laundry room with small 2-light sash. A secondary exterior wood stair with recessed porch accessed the rear hall at the new wings east elevation. The entry door has one-light with three-light sidelights and a multi-pane transom. The porch was later screened. At the west elevation of the rear wing a one-story porch with exterior wood stair and shed roof was built to access the kitchen and a rear servant stair entry to the second floor. The porch was enclosed in 1937 when the 1908 kitchen was remodeled. 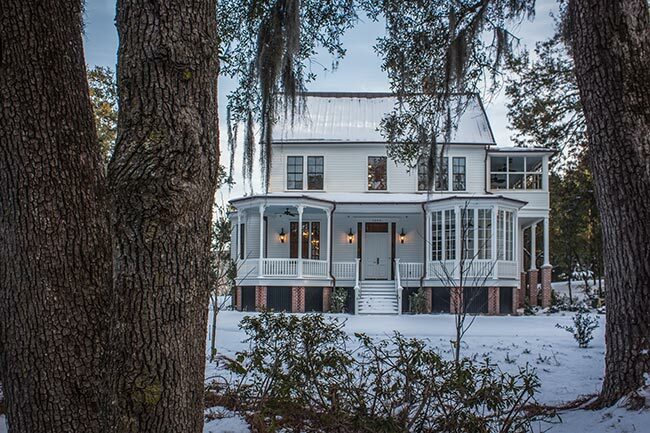 Its exterior has two-paired eight-over-eight-light double hung wood sash at its west elevation with a six-light over three panel wood entry door at its south elevation. The rear wing’s 1908 hipped east dormer has two-paired six-over-six light wood sash. The 1908 larger west dormer has four six-over-six sash. In 1924 a second-floor sleeping porch was added across the end of the upper west elevation. It has a shed roof with screen panels between square posts that rest on a weatherboard bulkhead. Second floor windows were changed to doors to access the porch. Supporting the sleeping porch are four square wood posts on brick piers with cast concrete caps. One of the posts has rotted. In 1932 a new one-story frame screen porch on brick piers was added to the south end of the kitchen and dining room wing with a flat roof. Existing south windows were changed to French doors for access. Glazed windows with plywood panels replaced the screening in recent years. The plywood panels are above and below a horizontal band of continuous single light windows on the rear, and side elevations of the enclosed porch. Diagonal lattice covers the underpinning at the foundation. The last major addition was in 1935 when an angled bay was added to the east elevation of the rear wing to enlarge the dining room. The bay was built with three six-over-six sash and matched existing siding and detail. The foundation brick of the main house has decorative corner broken bonds at its angled piers. Common bond red brick has been infilled between the original piers of the main house. The three red brick chimneys project from the roof; each of the corbelled stacks is topped with flat metal-screened hood. The two that rise from the main standing seam metal roof are behind the ridgeline. The rear chimney is a flue from the kitchen and rises from the center ridge of the roof. It was rebuilt in 1934. This building is currently used as a rental house. The original detached Garage for Quarters F was constructed in 1936 and was located just behind the quarters to the southwest and included servant’s quarters. The present garage replaced the original garage and is not within the district’s period of significance.